How to Run a REST API Request with Template Parameters? When running a REST API request, you need to provide a actual values to each template parameter as shown in this tutorial. 2. Click "File > Import" menu to open your SoapUI test project stored in "\fyicenter\REST-Project.xml". 3. Double-click on "Request 1" under "REST Project 1 > https://api.iextrading.com > Quote [...] > Method 1". You see the "Request 1" window. 4. 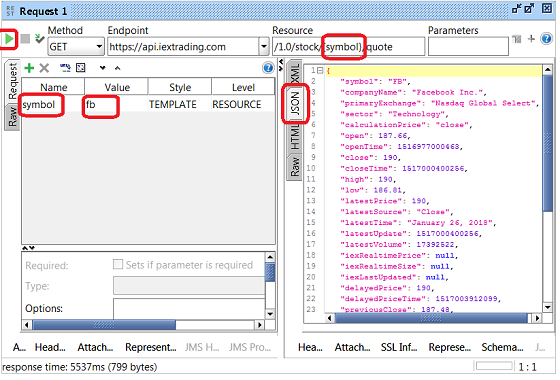 Click in the "Value" field of the "symbol" parameter and enter "fb" as the new value. 5. Click the "Run" icon. You see the request executed. 6. Click the "JSON" tab on the response panel on the right. You see the response displayed as the JSON data format. 7. Click "File > Save All Projects" menu and save it as "\fyicenter\REST-project.xml".